I have been trying to change my diet, everyone’s really. I would like to lose some weight but have permanently renounced diet food, which brings me to The Full Plate Diet. Oh my goodness, what a great, healthy, encouraging, and practical way to shed pounds! Making sure you have 40 grams of good fiber in your diet every day is a challenge, as is drinking 10 glasses of water. But I can’t tell you how much better we all feel already. Whole grain breads, salads twice a day, several kinds of fruits and vegetables on our plates for each meal. Ten “non diet food” pounds down…I will keep you posted. Drizzle olive oil in bottom of 9 X 13 pan. Add potatoes, onions, and garlic, toss to coat. Sprinkle with sage, parsley, salt, and pepper. Roast in oven at 375 degrees until vegetables are tender. Delicious served with roast chicken or pork chops. I had bananas getting too ripe on the counter yesterday and remembered I had this recipe filed away so I decided to try it. Grandma was thrilled. It is not a healthy recipe but it sure was yummy! Mash bananas and set aside. Cream together butter and sugar; add eggs. Mix dry ingredients and bananas into mix but don’t over mix. Stir in nuts and gently add caramel topping without mixing into the batter but leaving swirls. Fill greased muffin tins 2/3 full. Bake at 350 degrees for about 20 minutes. Makes 16 miniature banana nut caramel cakes. Can be dusted with powdered sugar or top with a thin powdered sugar icing. These are much richer than muffins and are really good served warm with a scoop of vanilla ice cream. Sprinkle ice cream with nutmeg and cinnamon for an extra tasty treat! Both of these recipes look so great, yum! I am unfortunately the only one in our bunch who likes sweet potatoes but I bet this would be divine with yukon gold potatoes too. Tonight I am roasting green beans, carrots, mushrooms, and Brussels sprouts (not mixed but in a beautiful arrangement in a pan)! Clay tells me that Brussels sprouts are the only things in the world he really hates, well maybe that and cilantro. I think it is because his mom loved them so much and maybe fixed them too often or in a weird way. Anyway, mine are drizzled with olive oil, savory, parsley, garlic, salt, and pepper. I have high hopes for them. 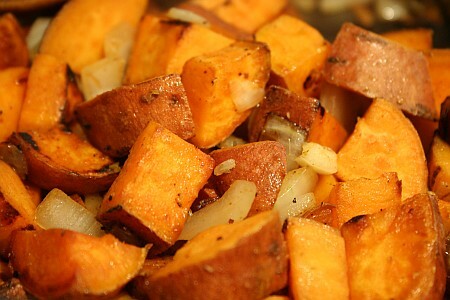 Oh, Stacie, I think the potatoes would be really good with part Yukon gold and part sweet potatoes. Janell made scalloped potatoes for us one time that had that mix and they were wonderful. Virginia, that sounds amazing! I love the idea of the combination of veggies. I just read that at least half of your plate ought to be vegetables for a healthy diet. I think that sounds wonderful. And btw, an exact quote from Clay regarding the Brussels sprouts “That is the vilest thing I have ever put in my mouth.” Joe, on the other hand, went back for 2nds AND 3rds! If you haven’t tried fresh garlic from the produce section, I highly recommend it. It is SO fresh and does not have the same over-taste/after-taste of the spice jar kind. Brussels Sprouts can smell a little funny while cooking, but I love the natural sweetness… and that can be a “selling point” for anyone with a sweet tooth. I do so love fresh garlic but I also like that garlic after taste in the minced in a jar! 🙂 This week I tried adding pearl onions to the mix. That was also wonderful.